Back to the 30 days of Paganism meme. This will be a quick one. I have very little personal interest in magic. Aside from the occasional casting divination and partly magic/partly prayer type of ritual in dire situations it has little purpose in my life. I do enjoy reading about magic rituals in historical/anthropological texts however. As far as beliefs go about magic, I’m kind of agnostic about it. I don’t really have any belief in it, but I don’t have much of a belief against it. I’m highly skeptical of people who claim to be witches, magicians, shamans, or sorcerers and they’ll have to do a lot before I believe they’re not full of themselves or being delusional (I can’t control who uses those labels, but there are too many cases where I find the use of the labels extremely questionable and ignorant of what they actually mean, and I blame New Age literature for much of that). However, I will admit that I think certain people in the world do have a legit magical/spiritual skill, and that there is a time and place for mystics in today’s world. It’s kinda like digging through a box of parts that did not come with instructions and includes a few odd parts . But you can’t know which is which until you start fiddling around and putting them together according to a vague idea of what the final product can be. In this case it’s a box of ideas and experiences that seem to link together, all totally UPG. If you develop hives at the very mention of the term, run now or forever hold your peace. So what got me started was this short but sweet article regarding “spinning magic” in the context of seidhr mentioned by Birka at her own recon/personal experience blog where she wanted to explore seidhr through recon methods. I was inspired to do similarly, as the nature of “magic” in my everyday life was something I was both fascinated and confused with. One of those “ever since I was a child” stories. When I got into Neopaganism as a young teenager I become exploratory, but nothing fit within the Wiccan or New Age schemes available at the time. I had to be aware of cultural appropriation from a relatively early start too, so neoshamanism simply irritated me and didn’t fit. It was all just so complicated sounding with the “required” tools and ritual steps, nothing like the simple but powerful magic in the old stories. Functionality was another problem I ran into. I viewed magic/shamanism/etc. as something that could make my paganism be functional outside of myself. I didn’t see any point in having those beliefs if they didn’t benefit anyone (be it human/animal, spirit, lands, or other). That was my major sticking point with Neoshamanism especially, so much of it did nothing for the community and acted as a self-help system instead. I had no use for that. Perchta, Miraculous Doe, spinning/spindles, crocheting, color red, that seidhr article I linked earlier, spiders, past profoundly “magical” experiences, foxes, connecting via “threads” or “webs”, love of the forest and occupying liminal spaces. There are a few others, but those are deeply personal and are similar to some of the things mentioned here anyway. My thought train is going down a path that ties (pun intended) all this together via the act of spinning. Seeing this (and other forms of craftsmanship) act of creation as something powerful and magical is nothing new. Churches had to actually pass LAWS throughout Europe banning such forms of magic, and Christians certainly weren’t the first to take it so seriously. I see no reason to not take it seriously either and subject it to recon exploration like anything else. Unlike a lot of other aspects of heathenry, however, this is something I can also experiment with, as I’m by myself and unable to do the community-based activities. Besides, why should Diana Paxson get all the fun? 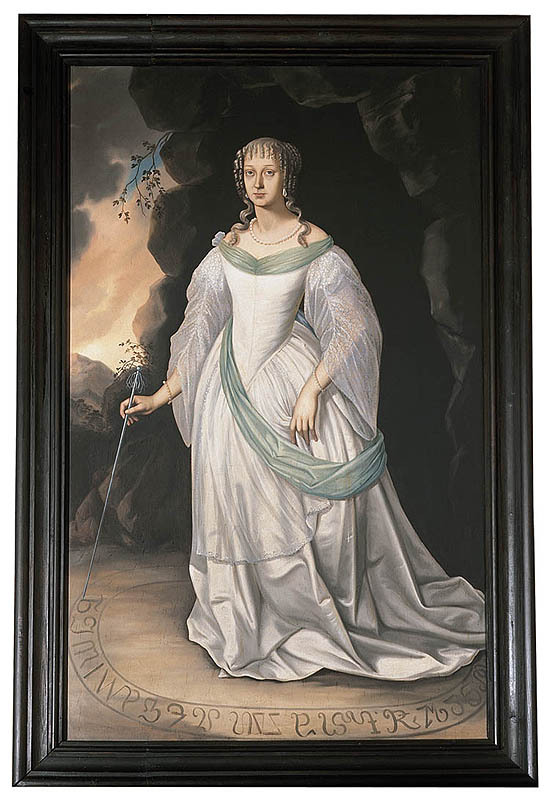 A painting of Lady Perchta of Rosenberg, thought to have added fuel to the Perchta myth of the Alps. Note the distaff being used to write strange characters around her. Regarding this “thread magic” practice, it’s something I already got started with soon after learning how to crochet. I made a couple blankets for babies and children in need, and while crocheting them I would say that the child who receives this shall become lucky in life, or something along that line of positive intent. I just didn’t know I could call it something fancy like “seid magic”, or that there were others that shared similar ideas. So in a way, this new attempt at magic isn’t all that new, it’s just given a sturdier and more colorful context. Course, I may just be feeling a more feral form of “Christmas in July”. I tend to get that every summer and this year it’s coming out with Perchta research. She was another part of the inspiration puzzle, as she’s a being I was attracted to for the past couple years. Just recently I remembered her associations with spinning, and boom, I finally figured out what to do with honoring her. More later once I start piecing the rest of the parts together and fleshing them out with time. Perhaps later we can return to our scheduled non-woo programing. Ok, so I lied. I ended up posting later than I thought…finals wiped me out and I wanted to rest a while before going back to scholarly reading. This will be a multi-part topic because it’s rather expansive even with just a few sources and leaves a lot of room for interpretation, which I want to play with. Consider the following as an introduction to the topic, as I will be expanding on details over time. As a trinket collector, I find amulets and the vast array of designs and meanings attached to them to be fascinating, even if they make no sense at first. Often there’s several layers of meaning attached to a single object, depending on location and personal perspectives (or agendas). They can be roughly divided into several categories: Protection, Fertility, Removal and Luck. 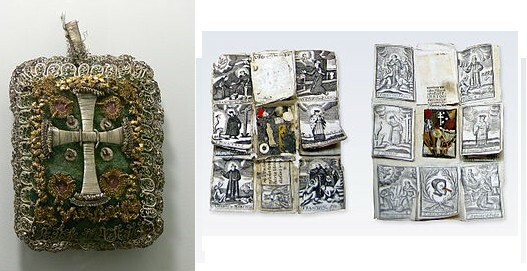 Protection amulets and charms are pretty widespread in their aims, as peasant life was riddled with problems. Protection of the fields/crops, home, and self against maleficent beings (disease, witches, devils and sorcerers) was key to survival. Fertility charms were less varied, as the main focus was to attract a mate and have babies. Both men and women used these, but literature tends to focus on the women’s perspectives for some reason. Occasionally, a fertility charm or amulet would be used on the livestock and crops as well. Removal refers to the removing of disease and unwanted beings from the body or from a location. Finally, there’s the well-known “good luck charm” that was used in the past too. None of these categories are mutually exclusive though. There is no “Religious” category because many of the religious items (such as crucifixes and holy water) were used as magical tools in non-religious ways by people (as in, ways not supported by official Church authorities). One such religious item that was used for folk purposes was the Caravaca cross, which originated in Spain and was introduced into Bavaria in the 1600s. There, they were put underneath the homes and fields, or on top of steeples as protection against lightening. This is essentially a Christian replacement of the Hammer, Ax, and 6-petal Flower (or 6 spoke wheel) symbols also associated with thunder and lightening in many places in Europe. 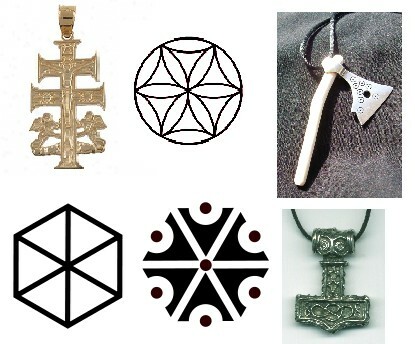 From the top-left: Caravaca cross, 6-petal flower, modern rendition of Perun's ax (symbolic axes are also found in parts of the UK). From the bottom-left, 6-spoke "wheel", Perun's "snowflake", and a modern rendition of Thor/Donar's hammer. Reason being is that storms were a big deal, a double-edged sword that people both welcomed and feared. Storms bring rain and lightening, both of which are beneficial to plants such as crops, but they also can bring damage in the form of floods, hail, and fire (and nowadays, vital electrical systems can go down as well). Naturally, people want the beneficial aspects to go to their crops and rivers while keeping the disastrous aspects away from their homes and stables, hence the protection symbols put on or near the buildings. The cross as a protection against thunder was explained earlier, but I have not found a satisfactory hypothesis on why the circular symbols were used. The ax and hammer use is probably due to how they sound when they hit their target, as well as the sparks that occur from metal hitting metal or stone. Protection of themselves and their livestock against the Evil Eye, witches* and devils were also vital, as it was a common belief back then that disease or physiological issues were due to a malicious being taking their strength away. This forms the plot of a great many folktales, though it’s hard to tell how serious the tales are meant to be (probably not too serious for some). One interesting example is the use of the first red egg laid in Spring being buried in the field before St. George’s Day (23rd of April in the West, 6th of May in the East), or the placing of the egg in a prominent location in the house. This was thought to increase productivity of the farm and prevent disease and natural disasters. Another is the Breverl, which is often hung around the neck, on a rosary, or the Fraiskette (a red string to which many amulets were hung in order to prevent different kinds of ‘fevers’ and epilepsy). Breverl. From the left, a closed breverl and two open ones revealing the miniature icons and a shrine-like center. Fertility charms are also varied, but their focus mainly is to gain a good mate and have a productive family (i.e. lots of healthy babies). In a world where babies can easily die, and many hands are needed to keep a farm running, getting a productive husband or wife could mean the difference between life and death. Especially the wife, as she needed to have a strong body to birth babies and run the household. Where there is a need, there is a magical tool to fulfill that need. One example was the use of a small glass bottle (called Geburtsfläschchen) filled with gold lace and tiny relics for the expectant mother. She would hold it in her left hand for a boy, and her right for a girl. Hastening childbirth was also very important, as the longer the labor went on, the more complications occurred. Malachite and clay imitations painted green were used in this fashion (either on their own or embedded into crosses), as well as hematite to help with bleeding. A cap called Fraisenhäubchem, similar to a skullcap, was also placed on a woman in labor for safety. These illustrate why fertility and protection items go hand in hand. Male fertility charms aren’t as numerous in my current resources, but I’m sure Géza Róheim has plenty to say about that. After all, he is a Freudian psychologist, and those are always fun to read. Removal items tended to focus on those already sick or in pain, such as the use of the bewitching dolls (rontóbábu) found all over Hungary. They differ in number, sometimes there’s 9 and sometimes there’s 13, and sometimes they’re called the Daughters of Herod, but the purpose is similar. Sticks clothed in rags become the “dolls”, and then they are circled over or rubbed onto the affected area. Then, once they are believed to have absorbed the disease, they are discarded via throwing away. A similar idea occurred with the act of rubbing strips of rags onto the diseased person, then tying those rags to tree branches. The wind is thought to carry the disease away. Water is also used for this purpose, since it was thought to wash away disease. And then there are lucky items, which seem to be the most personalized form of amulets and charms, as something that is considered lucky tends to be up to the individual and certain circumstances, not just something derived from their culture. Strangely shaped stones and crystals that were found were sometimes kept for this purpose, on top of their use for various ailments and protection purposes. Coins were also used, in order to become lucky and attract money. Like attracts like in this case. This is, by no means, the end of my exploration into this subject. Stay tuned for Part II: Rituals. *I’m well aware that some people today, such as those in the NeoPagan groups, in the Western world call themselves witches. I am NOT referring to these witches, but rather the witch of old folktales and cultural beliefs. There were “bad witches and devils” even before the rise of Christianity in old cultures, they were just re-purposed and renamed for Christian use as well. Ettlinger, E. (1965). The Hildburgh Collection of Austrian and Bavarian Amulets in the Wellcome Historical Medical Museum. Folklore, 76(2): 104-117. Newall, V. (1984). Easter Eggs: Symbols of Life and Renewal. Folklore, 95(1): 21-29. Knab, S. H. (1996). Polish Customs, Traditions, & Folklore. New York: Hippocrene Books.